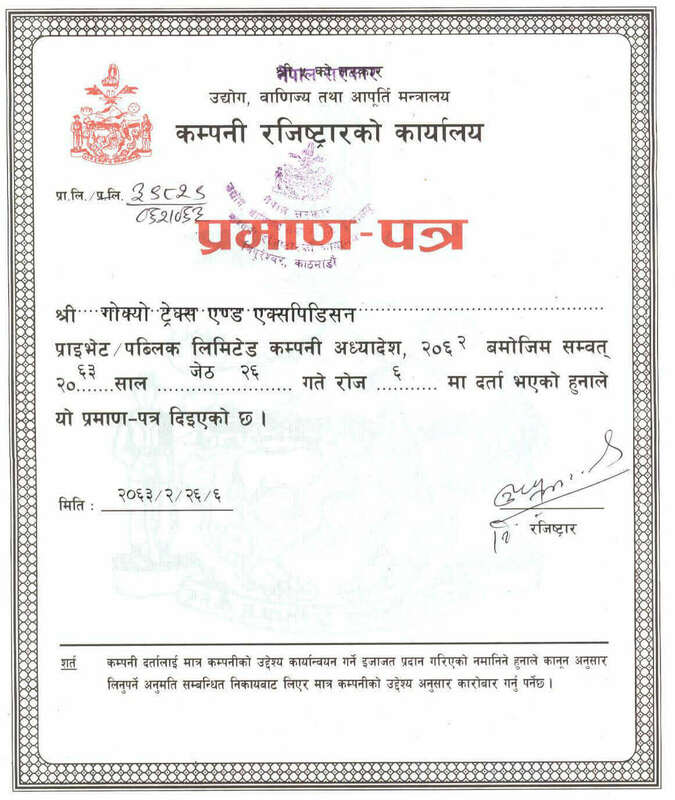 Company Certificates about Gokyo Treks ! 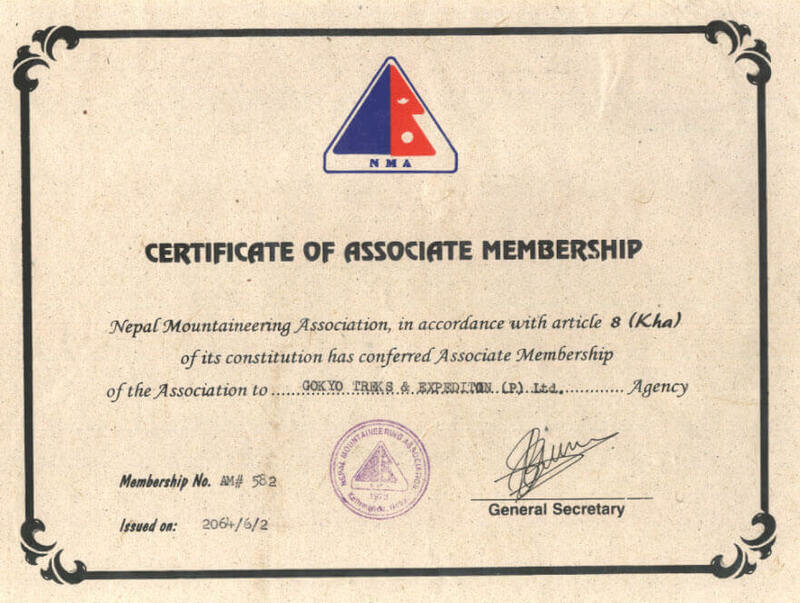 Before booking your trekking tours or climbing in Nepal Himalayas with trekking agency, it is quite important to know company certificates whether the company legally register under the law of Nepal government authorities as well as other authorize trade travel associations of Nepal. It is always very important to aware that there are many companies running a business without valid licenses; a business that does not observe the legal formalities imposed by the country act. Furthermore, we have seen many examples of so-called trekking / touring agencies illegally operating by individuals & freelancers through their own personal websites. Likewise, it is also come to know that some abroad tour operators have been involved with directly operating tours and trekking expeditions without the required governmental licenses and without paying the appropriate taxes. Thus, if you book your trip with an unauthorized agency in Nepal or abroad, there is a greater risk that problems will occur during the course of your time in Nepal. In order to protect yourself from these problems, take the following hints into consideration prior to confirming your journey with any trekking or travel agency. – Is this company registered within proper government authorities? – what about the company registration within appropriate authorize travel associations? – Is this company insured against accidents happening to their staff? – How about this company environmentally conscious? – Does this company have its own Bank account with a reputable bank? – Company clear of back Taxes? We at Gokyo Treks & Expedition Pvt Ltd. offer you hassle free with secure travel arrangements and are committing to make your holiday safe and enjoyable. 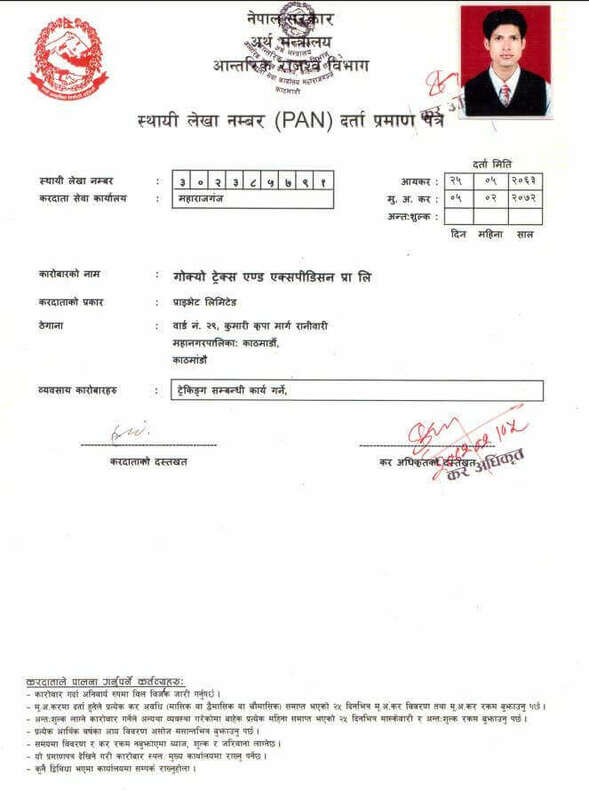 Take a look our company certificates as given here.